Search on the desktop has been a staple of Windows for years now, but many users don’t know just how truly useful it is. When you search from the desktop, you can find anything, anywhere, including non-indexed locations. This means you really can’t lose anything, if you know how to look for it! In this lesson, we’re going to cover searching from the desktop. As we mentioned previously, Search on Windows is everywhere and the desktop is no different. 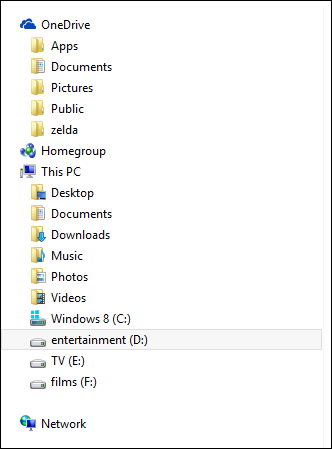 Each File Explorer window you encounter will have a search box in the upper-right corner. Searching from Explorer can return both indexed and non-indexed results. Further you can refine your searches by using the Search Tools that appear whenever you select the search box. Coupled with the details view, you can quickly find the files you’re looking for with some well applied filters. We already know the Start search and how that can yield productive results. The problem is, the Start screen’s search results only return indexed locations. This means that if you have a lot of files spread over many drives, or you want to search for system files, you won’t find much to go on from the Start screen. Searching from the Start screen is really intended to provide fast accessible results that you’re most likely going to search for: documents, images, videos, and settings. To really find what you’re looking for you need to search for stuff from the desktop, namely from File Explorer. So, let’s dive in and get to learning! If you use the Windows desktop, then searching from the desktop is probably going to be your default method. 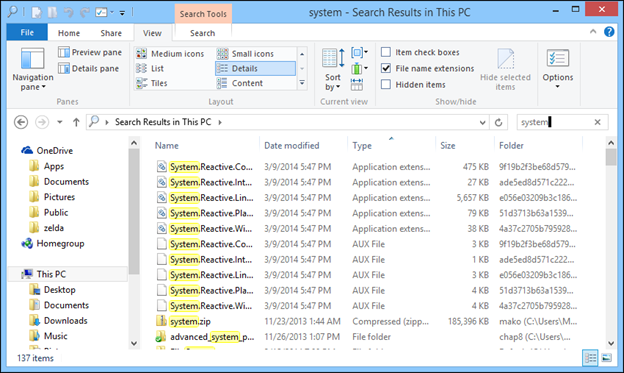 Anytime you’re using a keyboard and mouse, the need to use the Start screen to search is usually pretty minimal because every File Explorer window has a search pane on it. Searching in this manner gives you an advantage. You can, of course, simply hit the WIN key and begin typing your query, which quick and easy. This is great if you’re sitting at your gate in an airport terminal with your tablet or working on your paper at a coffee shop. At home, however, you might have several external hard drives or a desktop with more than one internal drive. In the following screenshot, you can see that we have several additional data stores and all of them have folders and therein many subfolders. In cases such as this we can add all these to the indexer or we could just go straight to the source and search directly in the appropriate location. Searching from the desktop will allow you to narrow your results appreciably and there are many tools that the desktop experience provides (such as Search Tools, which we’ll cover in this lesson) that will let you hone your queries for more exact results. 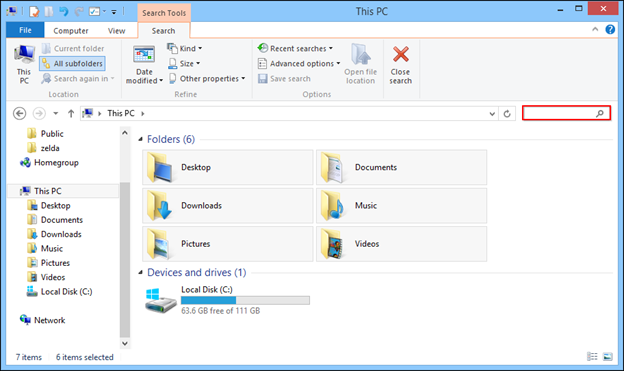 While you can search from the File Explorer for files anywhere on your system, you can also search the Control Panel for settings. Remember back in Lesson 2 we discussed how to find settings from the Start menu by choosing the option from the dropdown menu or keying in WIN+W? From there, you can key in the settings you want to locate, and Search will return both PC Settings and control panels in its results. 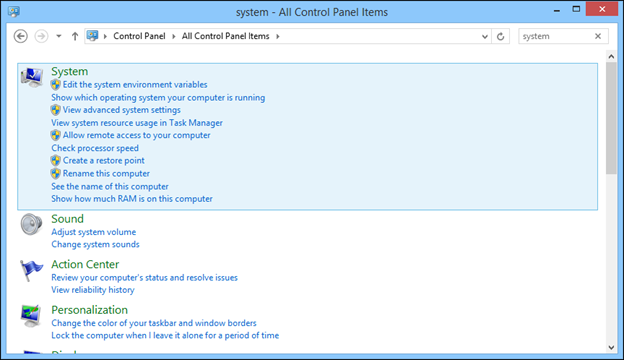 Similarly, the Control Panel will also return settings but only the desktop versions. You see in the above screenshot, we do a search for “system” and the Control Panel search returns every instance that contains that word. 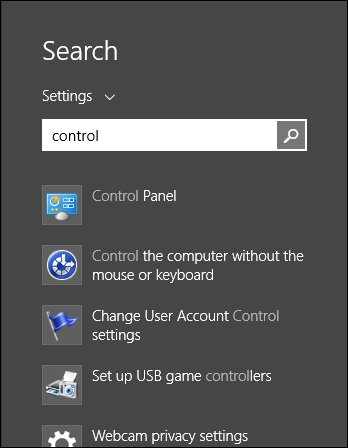 Keep Control Panel search in mind, it’s a pretty efficient way to find stuff so you don’t have to keep rummaging through all those control panels for the settings you want. 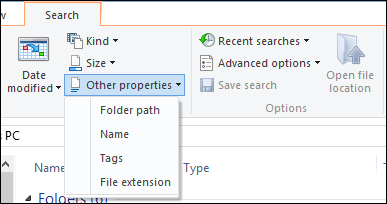 When you click on the Search pane in an Explorer window, the ribbon changes to Search Tools (we discussed the Ribbon in our Windows 8.1 series). Unless you’re doing simple searches with one or two terms (“control panel,” for example), you want to pay close attention to these tools, which let you quickly cut through your search clutter. There are three section that appear when the Search Tools are activated: locations, refine, and options. Let’s talk about each one more closely. The first section, Locations, let’s you specify where you search and how deeply. For example, if you want to search your entire system, you can click “This PC” and your search will crawl through the entire computer. 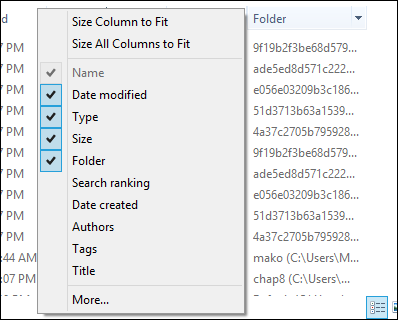 If you choose a folder, which contains subfolders, then you can decide whether you want to limit search to the parent or Current Folder or have the search return results from all the subfolder. Finally, if you’re conducting the same search in several locations across your system, you can conveniently search again in your Libraries or the Internet. The Refine section is really your first foray into Advanced Query Syntax. Here you can refine your search according to four criteria: date modified, kind, size, and other properties. Let’s further discuss each one so you see how it’s laid out. 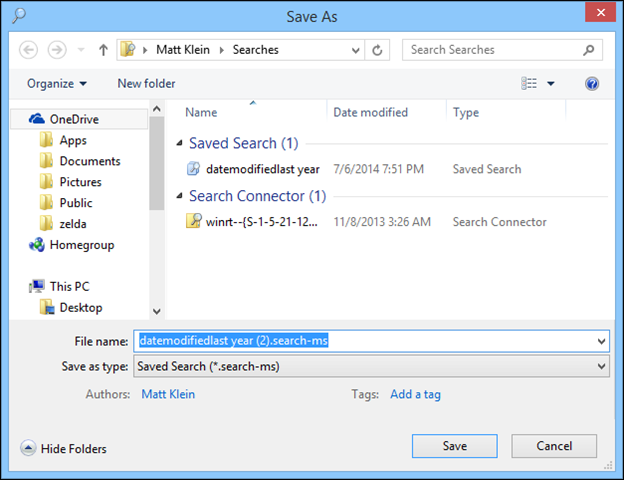 If you know when a file was modified, you can use this to narrow down your search. 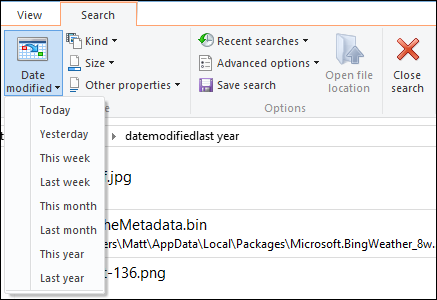 Using the date modified filter is a great way to narrow results down to a time-frame so that for example, if you know about when you modified a file, you can constrain your search so it doesn’t return results from an irrelevant time period. For example, let’s say you have a series of articles that you wrote about one subject over the course of two years, but you know the one you’re looking for was written last year. 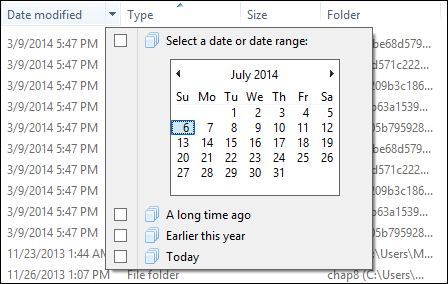 You can use the date modified to constrain your results, so you only see files modified in the previous year. We will show you how to further pare down your results in the later section on the details view. There’s a ton of different kinds of files on your system and, while you may know exactly what you’re looking, for you may not know exactly how to find it. By using the kind filter, you can quickly hone in on a certain file type and quickly drill through your results. For example, you can search for videos, music, movies, and more. There are actually quite a few “kind” filters to choose from on this simple dropdown menu so you should check it out yourself! The size filter quickly makes short work of limiting your searches so that only certain-sized files appear in your search results. 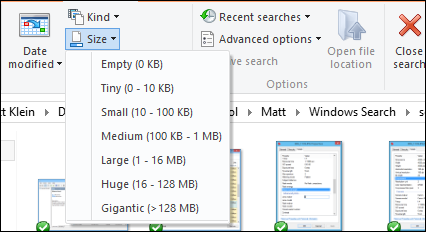 You can refine you searches anywhere from empty files (0 KB) to gigantic files that are larger than 128 MB, and many places in between. Finally there are various other properties that you can refine your searches. These properties will often vary according to a folder’s contents. For example, in the following screenshot, you can filter results by folder path, name, tags, and file extension. However, in the next screenshot, we see a folder containing image files and as you will note that the other properties include date taken and rating. If you are in a folder consisting of video files, you might see and additional “length” filter, and so on. The final section on the Search Tools are options that you can apply to help make your searches less tedious. Many of these options allow you to take the work out of performing frequent, repeated search, and as you’ll see, the Advanced Options give you some very convenient shortcuts to the same options we discussed in Lesson 1. A nice way to look for data in several to many different places is using the recent search feature. If you’re looking for a particular image or document and you have many different promising locations to search, you can use the same recent search over and over until you find it. In a similar vein to recent searches, you can also save frequently used searches for later, repeated use. Searches can be saved anywhere that is convenient for you but, by default, they are placed in your profiles under Searches. It’s a good idea to give your saved searches a descriptive name, so you can easily apply them just in case you have a lot of them. You don’t want to have a whole bunch date modified searches grouped together because that could make things just as time consuming as simply browsing for files the old fashioned way. The advanced options give you immediate access to the options that we discussed in Lesson 1. So we don’t really need to cover how to use these options. If you select “change indexed locations” for example, it will open the Indexer Options control panel and you can then modify what locations the indexer crawls. Below this, you can see that you can add options such as those found in the Folder Options’ Search tab. 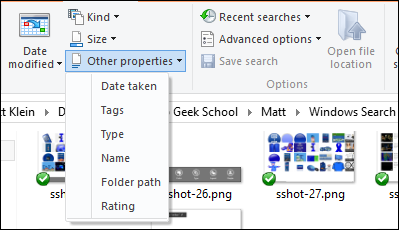 So, if you want to search for the contents of a file, system files, or compressed files in non-indexed locations (options that will ultimately slow down searching), then you can quickly enable those options here. When you initiate a search in a File Explorer window the results appear instantly. This can lead to dozens, if not hundreds, of results. If you’re looking at these results in an iconized view or tiles then you could spend a lot of time trying to find your file unless you know the trick to narrow your results down further. We’re going to talk about Advanced Query Syntax in the remaining two lessons but we’re going to close out this lesson on how to sort and display results via the details view. Check out the screenshot below and see what we did. You’ll note that we did a search for “system” and that yielded quite a few results – 137 to be exact – which are highlighted in yellow. In order to better slice through these results, the details view lets us sort columns by a number of criteria. So, if you wanted to sort everything by descending or ascending alphabetical order, you could do so by clicking on “name.” Similarly, if you’re looking for image files, you’d click on “type,” and so on. That’s not all though, you can extend the functionality of these columns by clicking on the little arrow next to each. A menu will drop down and you’ll see even further filtering options (it might take a short bit for the computer to calculate the available filters in that folder). In the first example, we see what happens when we want to filter by date, you see you can date or date range, or you can choose one of three additional filters below that. If we select “earlier this year” we are shown a dramatically reduced list of results. You see we now only have 28 items to choose from and next to the “date modified” column there is a check mark to show there’s a filter applied. 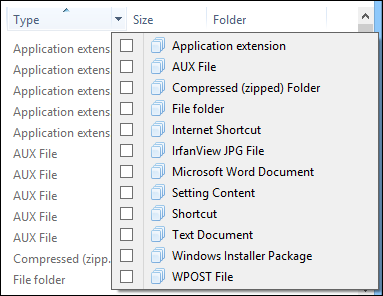 We add one more filter, this time choosing “Windows Installer Package” from the list of file types filters that appear. And now you can see that we’re left with one result. Note also on the Search Tools, you can use the same tools as before. You could, for example, choose to save your new search, add more filters, or search through further subfolders. You’re not restricted to the columns that appear in the details view either. You can add other columns and even remove existing ones. Simply right-click anywhere on the details columns and you’ll be given quite a few more choices. Click “More…” and you are given a list of dozens of more columns you can add and thus use to filter displayed results. The chance that you’ll use any of these hidden columns is probably unlikely. Most of what you’ll find here is very specific and applies to a particular kind of file. For example, there are quite a few choices devoted solely to photographic image files which will rely largely on how much metadata is available in such files. Similarly, there are quite a few items that apply to contacts, such as addresses, postal codes, and things like that. Rather than activating these columns just to satisfy such a focused search, you could simply use Advanced Query Syntax, which will let you find things using these same specific filters but with far fewer steps. 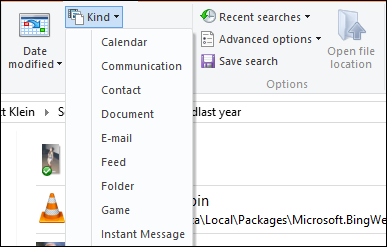 The search options are on the Folder Options, which can be found in the Control Panel. The Search tab probably should be lumped into the Indexing Options but here they are instead. 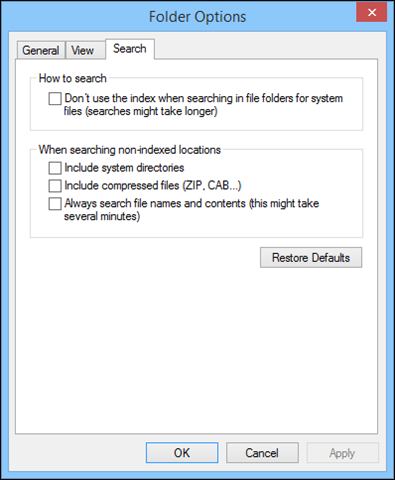 The first option turns off the index when searching for system files in folders. Obviously, this won’t affect search if you are looking for stuff like images, documents, and videos, but if you want to find system files, search will be noticeably slower since they won’t be right there in the index. If you’re conducting searches in non-indexed locations, let’s say you add another hard drive, then you can have your searches include system folders and compressed files. You can also have searches automatically include file names and contents. All these options, particularly the last one, will slow your searches down a bit. Finally, if you’re unhappy with these options, you can restore everything to its defaults. Before we end, note you can access these last three options immediately from the Search Tools ribbon. 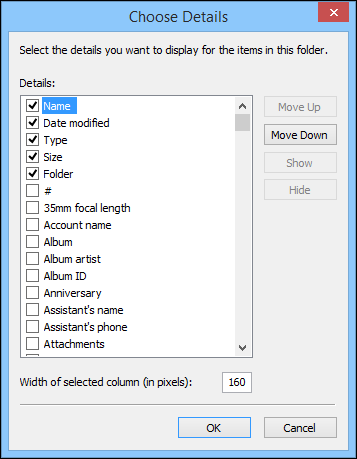 You can also open the Indexing Options control panel by clicking “Change indexed locations” so you don’t even need to leave the File Explorer! That just about does it for today. You’re now fully prepared to assume your roles as Search Ninjas, but first we have to cover the previously mentioned Advanced Query Syntax. We’ll start teaching you all about that tomorrow starting with some basic stuff like Boolean and date operators. In the meantime, we want you to do your homework. Take some time today to practice searches from the desktop. For instance, try out filters using the Refine tools on the Search Tools, as well as employing what you just learned about the details view.